Sitting back see video at 30 seconds with a prominent "crease" in the clothing comes from sitting back correctly. It is very easy to get rusty with push hands and crimping (bending) your own arm at 60 seconds in if there is no opponent to practice with. 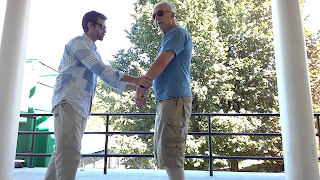 Reasoning logically, however, shows that is a "red herring" since "sitting back" correctly comprises half of the movements in the Tai Chi form...quite an implication. I practice it while waiting for water to boil, the dog doing business, in line at the supermarket, etc. It is logical to think that we all have a subconscious fear of losing balance. Good to lightly touch something which relieves subconscious fear of losing balance and frees up the mind to check your structure so see the picture of Master Hwa's at the post which shows legs even with one another. 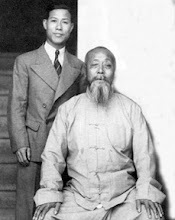 He tells me Wu Chien Chuan told Young Wabu to constantly check this point during sitting back by examining the upper part of both legs to see if they were even with each other. I quote: "Sitting back and turning is an important move to neutralize and ward off an incoming thrust and destabilize the opponent. If the body is not facing the opponent squarely, one will not be able to turn the upper body on the weak side sufficiently to be effective." The teachers are Sifu Jim Roach with Sifu Tom Kostusiak and Sifu Jason Bulger. 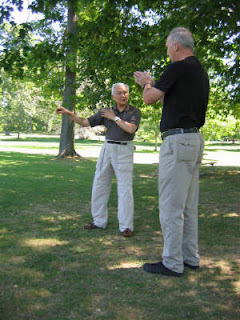 Master Stephen Hwa Ph.D. is doing much more in online instruction at https://classical-tai-chi.teachable.com. The preparation Form 太極起式 Posture 1 – The Preparation Form although called "preparation" really feels and looks like 2. Raise Hands 提手上勢, using relatively the same "internal discipline" https://www.youtube.com/watch?v=2Uo9lQ6azVA&t=25s, engaging the core where the difference can be seen and felt in the angles of the arm. Of course, the "form" is done slowly as seen here https://www.youtube.com/watch?v=7GyzH6W15Ykand not done by using such a burst of energy as in martial application. We are using this as a martial application to "ward off" an opponent and illustrate the "form". 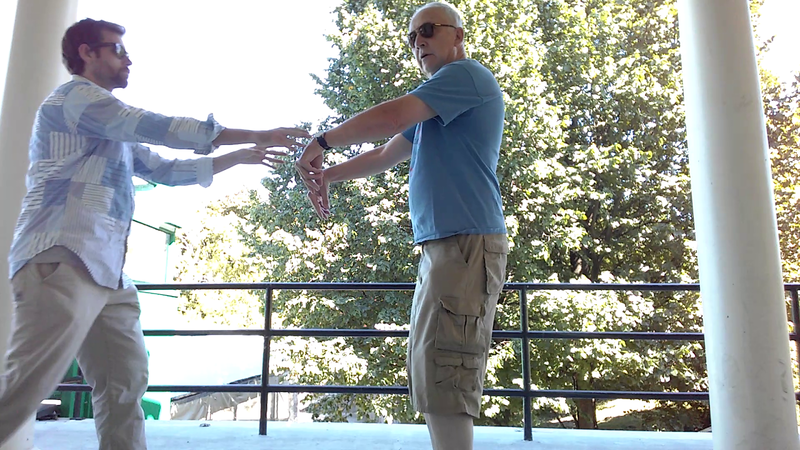 Here the bending of wrists being used first "forward" "Z" axis then on a vertical or "Y" axis, then forward on a "Z" axis is beneficial as opposed to what we spoke about in the previous Facebook discussion of Master Hwa's "Fundamentals of Push Hands" https://www.youtube.com/watch?v=NORbRqOPxPs&t=19s. 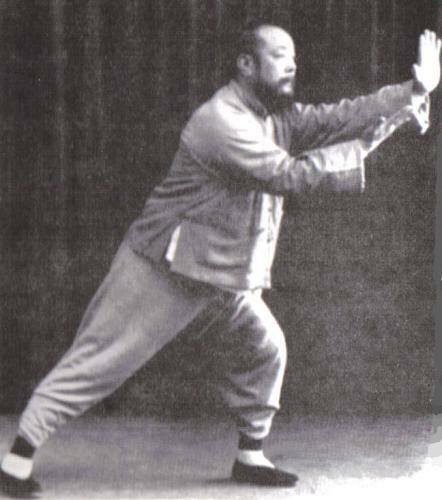 Without the inward contraction of the abdomen and stretching down of tailbone to raise the arms using other Tai Chi one is relegated to an "external" motion of the body even actually tilting forward and back to move the opponent. 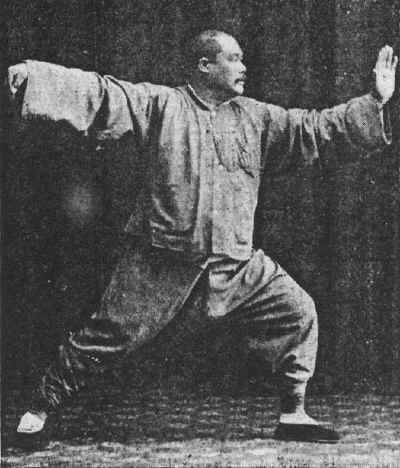 It is said nowadays in Wu's Style that one cannot develop any power (to do such things as punch) from turning at the waist, that one must “use the hips”. "Ma Jiangbao: This is connected to the last question. In the Wu style, the feet are often parallel. If you turn in these postures from the hip, you will lose your central equilibrium. So we turn the body around the waist. In this, it is also easy to divert an attack and let it fall into the emptiness without losing your own central equilibrium." 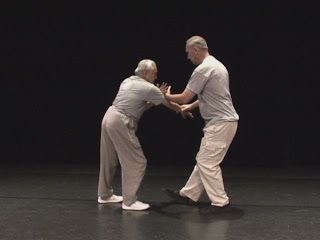 Proper use of hips in coordination with waist as shown in the cooperative push hands (although push hands is not shown in this clip one can certainly see the up close "fa jing" power and it is minus ANY hip turning...is it not?) training of Tao of Martial Applications DVD . This is indicative that turning the hips is not eschewed, it just means that it should be done with the right timing. For example, one could offset an opponent’s balance in a close-up confrontation using internal discipline (internal movement) then a much larger step (stance) could be taken whereby the opponent is thrown to the ground using the motion of the hips in the process (external movement). The motions of the "Repulse Monkey" section of the form come to mind there as an example "Repulse Monkey"
Push Hands or NOT to Push Hands, that is the question! Push hands is really an application of Tai Chi form practice. 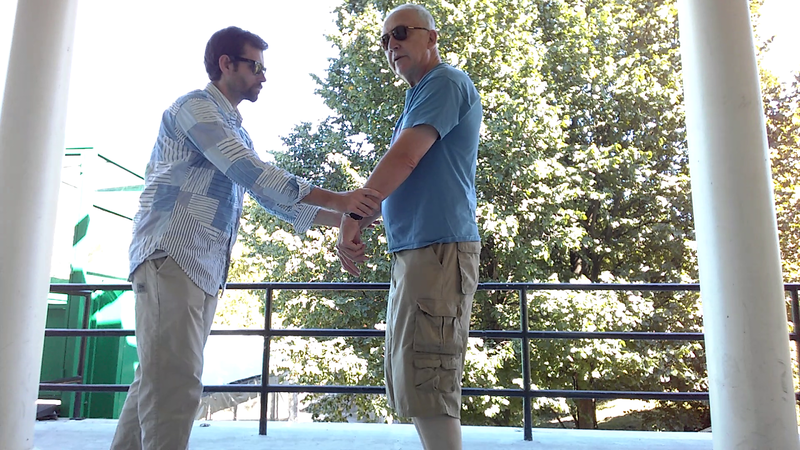 Usually, a student is not taught push hands until the student has practiced tai chi form for a while and has a feel about the form movements, in particular: a. The sitting back movement appears very frequently in the tai chi form and is not easy to master. It is the defensive position in the push hands. b. The forward movement when you move your body weight to the front foot, such as in the walking forward brush knee is the offensive position in the push hand. c. Turn of the upper body with pelvis essentially not moving as shown in the section of Internal Discipline in the Tai Chi Overview is the ward off move in the defensive position and push off move in the offensive position. d. There are several other more subtle moves. All these moves you will learn in the form practice. What is unique about the push hands is that it provides the opportunity for extended contact time with your opponent, so-called stick to your opponent, when you can learn how to control your emotions, your body, and how to detect your opponent's intention and respond accordingly. Other kinds of sparring exercises all have such short contact time with the opponent. There is no time to learn such subtle aspects about yourself and your opponent in sparring as opposed to push hands. A question from S.T. "The beginning forms of Classical Tai Chi are very difficult to learn. There are just too many things going on at the same time, without even including any internal discipline yet. The few movements that I think I can do feel very awkward, not the smooth movements shown in your video. Help!" MASTER HWAíS REPLY: "One way to simplify the learning process is to first concentrate on the footwork and the corresponding shifting of body weight, pay less attention to the upper body movement. In that way, the amount of complexity is reduced greatly. Once you are more comfortable with your footwork and its corresponding shift of body weight, you can pay more attention to the upper body movement. A common mistake of the beginner is that they are attracted by the graceful upper body movements and therefore eager to learn the upper body movements. The footwork appears to be unremarkable and attracts less attention. The fact is that footwork and its corresponding shifting of body weight is the foundation of tai chi and any glitch in that area will result in a loss of balance, awkwardness, the heaviness of the foot and worse, a foot glued to the ground cannot be moved. It is very important to practice the Tai Chi Walk. This will give you a good foundation in footwork. " 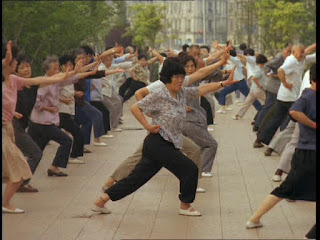 Jim K. said: I fluctuate from wanting to be a Tai Chi fighter to just being happy mastering the 108 forms. This dilemma comes from my age. 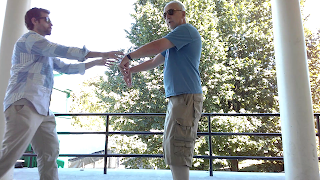 When I hear you learning push hands, and sticking to your opponent takes a long time, it seems that in my late 60's, I may not have enough time to accomplish my first love - martial application. So the question is: Should I take on a lesser goal of mastering the form or should I when the time comes to push on to do push hands, sticking and sparring? 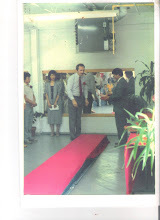 Master Stephen Hwa's reply Hi Jim: Practice of Tai Chi form is to develop power, especially explosive power such as fa jin. Practicing the form cultivates the internal power and the ability to maintain a relaxed body with the flow of internal power. This enables one to develop explosive power and the ability to deliver it. All these are best accomplished by practicing Form only, not depending on practicing push hands or sparring. Push hands and sparring are important to develop the "Timing" - when to use the power, the "Strategy" - how to take a position of advantage and put the opponent in an inferior position and the "Sensing" - knowing what the opponent is trying to do. When one reaches the stage that internal discipline becomes second nature, then one could concentrate more on push hands and sparring. Otherwise one might develop bad habits of using external move during sparring. The problem is that people try to study and learn the 13 Movements: "peng, lu, etc." without first developing the internal energy for fa jin. It is like putting the cart before the horse. Aging is associated with a progressive reduction in neuromuscular control, but it can be headed off. "A healthy nervous system is prized in China", Stephen Hwa Ph.D. Try an easy movement to test yourself: Raise your whole arm out to the side...easy? Now raise to the side and stop, note where your elbow is, hold it completely still and raise just the forearm...harder? Master Stephen Hwa: "Explanation is that you have to tune your neuromuscular control (using principles of Classical Tai Chi) so that you move one but not move the other". New to Classical Tai Chi? Click here! differences between the two Taiji Forms. In the above discussions, I have emphasized the differences between the Square Form and the Round Form. Actually, there is more sameness than differences. The lower body movements are identical except at certain places that the pivoting on the toe is different between these two forms. The starting point and the ending point of every movement in the Square Form provide definition to the curved movement in the Round Form since the curved movement has to pass through these two points. Therefore, the Square Form is a template for the Round Form. One of the most important missions of the Square Form is to learn how to keep the nonmoving part of the body (yin) still. It is the nonmoving part of the body that defines the junction between moving and nonmoving (yin and yang junction.) Any movement of the yin part alters the junction and thereby changes the character of the movement. To achieve the stillness is almost as difficult as making the correct movement. Both requires intense tuning of the neuro-passage way and neuro-muscular control. 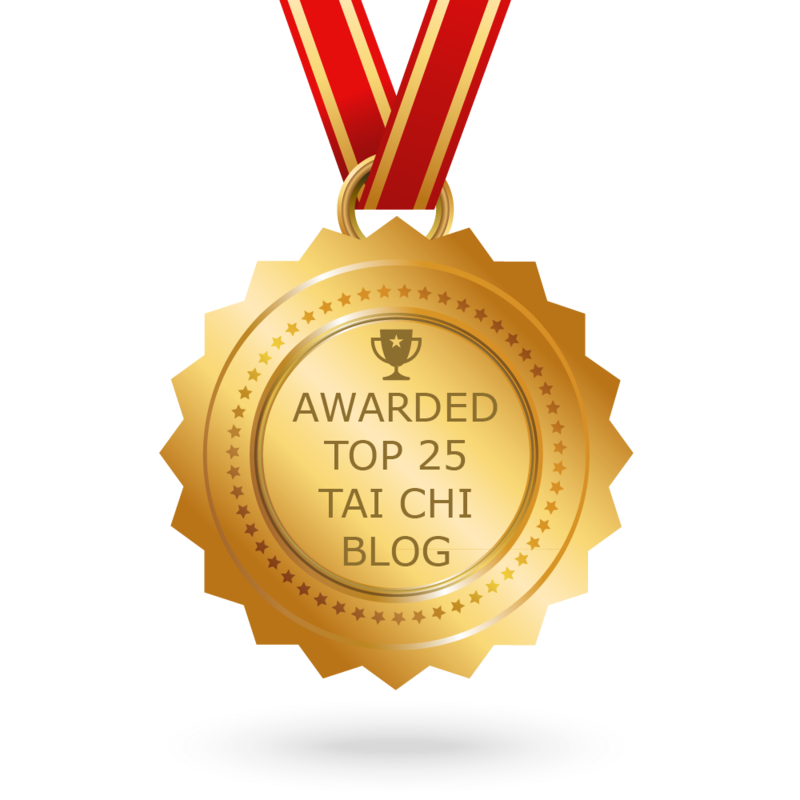 The “full stop” between Tai Chi moves is important in preparing the next move by gathering the energy for the coming move. That is why the moves in the Square Form are resolute and abrupt. Many students are impatient about the “full stop.” which results in tentative and weak moves. The Round Form, generates energy or power continuously and smoothly which shows in the movements of a seasoned practitioner"
Stephen Hwa, p. 50 Uncovering the Treasure " To be able to keep part of the body still, by itself, is also important training to eliminate unwanted habitual motions (some disciplines call the unwanted habitual motions "Parasitic movement") "Sometimes it is more difficult to train students NOT to move than HOW to move" For example is Yin/Yang pairing of the quarter body: "Burst of energy" or "Fajing" impact force of a strike or punch then equals the amount moved in the desired direction by 1/2 of the "pair" minus the force generated by not moving the muscle of the other 1/2.